There are a few ways to get Lao visa extension if you want to stay longer in Laos when your visa expires. You can do it yourself, or have a service provider to do it for you. 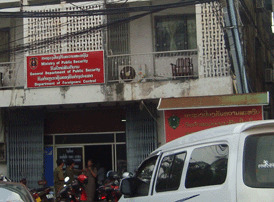 It is possible to get all types of Lao visa extended (except for Transit Visa) at the immigration office in Vientiane. It costs 20,000kip (round US$2,50) per day if you apply before or on the expiry date. However, if you do it after the expiry date you will be fined for US$10 per day for the days you over stayed. If you are in Vientiane, you can apply for visa extension by yourself at the Immigration Office behind the Joint Development Bank (JDB) on Lane Xang Avenue, opposite the Morning Market (see map below). The office is open Monday to Friday, from 8:00-16:00 (closed 12:00 to 13:00 at lunchtime). The office is close for applications on Friday afternoon. Lao native age 65 years and over are exempt from visa extension fee. Lao native in different age groups get different privileges, check out visa exemption page for more details. The process is straight forward, just fill out the application form then submit together with your passport and the photo and pay the fees. In normal circumstances your visa is usually ready the same day. Note: If for some reasons you can't make an effort getting to the immigration office for visa extension but want to stay a few more days, then you might as well just stay as long as you prepare to pay the fine (US$10 per day). This fine will be collected on your departure. However, be advised that this might not be a good idea if you plan to exit Laos at border check points other than Lao-Thai Friendship Bridge in Vientiane, or main airports as you might risk being taken advantage of by some not-so honest officials when it comes to paying the fine. Get a travel agent or specialist provider to do your Lao visa extension for you. Most travel agents can arrange it for you with small overhead fee. This varies between providers, so shop around for the best deal. This option is better for those holding visas other than tourist visas because it involves more paper work and it's more complicated and would take you more time and money if you did it yourself. I would also recommend this option to holders of tourist visas who plan to travel in provinces other than Vientiane Capital where there are no immigration offices and the visa run (exit the country and enter again) option is not possible. This option is more suitable for tourist visa holders who wish to stay a bit longer, say 15 -30 days. What you do is just leave Laos at a border checkpoint nearest to where you reside and come back to get Lao visa on arrival. The visa fee ranges from US$20-US$42 depending on nationalities. It is more worthwhile compare to visa extension that costs you US$2.50 per day. A 15-day extension will cost US$37.5 plus 25,000kip (around US$3) service fee, that is more expensive than visa on arrival fee for most nationalities. If you are in Vientiane or Savannakhet or other provinces close to international border crossing points, you can cross the border to one of the neighbor countries then return and get a Lao visa on arrival at the checkpoint. In Vientiane it is very easy, you can take a public bus (around 6,000 kip) from the city to the Lao-Thai Friendship Bridge. Complete the immigration procedures on the Lao side; then take the shuttle bus (4,000 kip or 15 baht) to the Thai immigration checkpoint and enter Thailand. If you want to come straight back into Laos, you simply walk to the departure channel just a few strokes away, get a Thai stamp-out at one of the immigration windows. Then once again, get the shuttle bus to cross the bridge back to Laos and apply for a Laos Visa on Arrival. This option can work out cheaper than US$2.50 per day if you plan to stay for 15 or more days.